I’m a total sucker homemade soda. 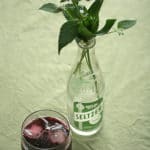 You’d never know it from reading this blog, seeing as the only recipe I’ve ever posted is a Blackberry-Verbena Soda, but there’s almost always a bottle of club soda in my fridge, ready to be mixed with fruit juice or a homemade syrup or even sipped straight-up. 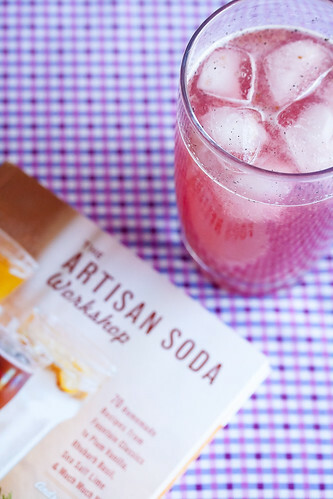 So, when I got an email asking me if I’d like to review The Artisan Soda Workshop by Andrea Lynn, it was basically an offer I couldn’t refuse! 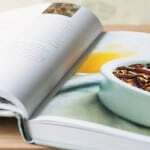 The slim soft-cover book contains a wide range of recipes for homemade syrups, ranging from classics like root beer and cream soda to more adventurous flavour pairings like pineapple-basil and carrot-maple, all of which can be turned into a fizzy refresher by stirring into seltzer. Equipment-wise, all of the can be prepared at home using basic tools like a saucepan, a potato masher and a fine mesh strainer. No fancy gadgets required, unless you’re inclined to splurge on a SodaStream machine to make your seltzer. While most of the chapters revolve around fruit and herbal flavours, there’s also an entire chapter devoted to copycat versions of popular commercial brands, including a natural golden cola, orange, grape and lemon-lime – and, unlike their storebought counterparts, there’s not a single articifial flavour or colour to be found. Even the vanilla in the cream soda comes from whole vanilla beans, rather than an extract. What I liked most about this book, aside from the amazing variety of flavours it offers, is the fact that all of the recipes are based on real, natural, healthy ingredients. 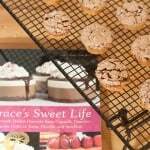 On top of that, quite a few of the recipes also use alternative natural sweeteners like coconut palm sugar, honey or agave syrup in lieu of white sugar, which makes this book perfect for anyone who’s looking to avoid the huge quantities of refined sweeteners and other additives hiding in commercial soft drinks. And if you’re not in the mood for soda, some of the syrups include bonus recipes for other treats like PB&J Smoothies and Cherry-Almond Milk, and there’s a small chapter at the end devoted to alcohol-spiked recipes if you’re in the mood to turn your syrup into a more grownup treat, including a Margarita based on a Sea Salt and Lime syrup that looks positively fiesta-riffic. 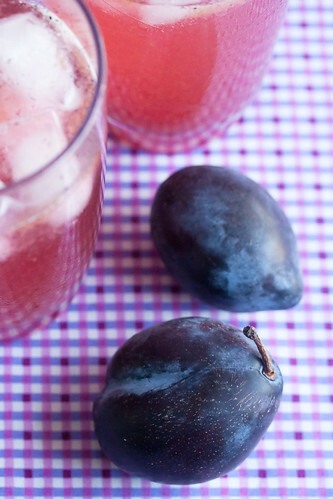 It was hard to choose just one recipe for my test run, but with plum season winding down, I eventually settled on the Plum Vanilla Syrup to use up some lovely Italian plums that were sitting in my fruit basket. The recipe was quite easy to follow, taking less than 20 minutes to prepare from beginning to end, including a little under 15 minutes on the stove to cook down the plums. The finished syrup has a dark purplish colour, which turns into a pale magenta when mixed with club soda. The flavour combination is wonderful, marrying sweet plum with exotic vanilla, and I just love the speckling of black vanilla seeds that dances along the top as the bubbles rise to the surface. Even better, while the book doesn’t really mention it, this is actually a two-for-one recipe – the leftover cooked plum puree makes a great topping for yogurt or ice cream. All in all, I think this is a fantastic book for homemade soda fiends like me, along with anyone who’s looking for a healthy alternative to storebought sodas, or who likes to experiment with unusual flavour combinations. I couldn’t be happier with this book. I’m already planning on making batches of Pear, Grape, and Honey Syrup and Apple Cider Syrup next, as soon as this plum syrup is finished. Disclosure: I was provided with a complimentary copy of The Artisan Soda Workshop for review purposes. All opinions, as always, are entirely my own. Recipe reprinted with permission. 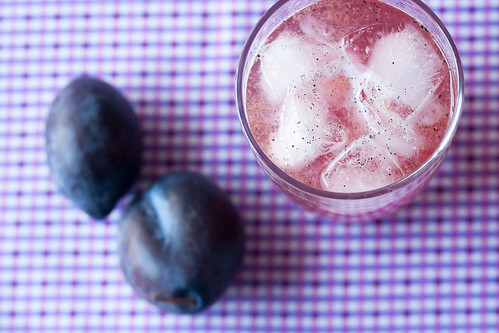 Mix up this lovely purplish-red syrup with seltzer for a delicious early fall refreshment. For a more grown up treat, it's delicious in a gin and tonic or topped up with your favourite sparkling wine. In a medium saucepan set over high heat, combine plums, water and coconut palm sugar. Using a sharp knife, split vanilla bean in half lengthways and scrape out seeds. Add bean and seeds to the syrup, and bring the mixture to a boil. Reduce the heat to medium-low and simmer for 10-15 minutes, or until the plums are soft enough to mash. Remove from heat. Remove the vanilla pod from the syrup, and set aside. Using a masher, smash the plums into a rough puree. Strain the liquid through a fine-mesh sieve, pressing the plum pieces against the strainer to extract as much goodness as possible. Transfer the syrup to a covered container, and add the vanilla bean back to the syrup for maximum flavour. Syrup will keep for up to 5 days in the refrigerator. PS - Don't throw out that plum puree! It's delicious spooned onto yogurt or ice cream! Stir 2 tablespoons syrup (or more, depending on your taste) into 1 cup seltzer or soda water. The sweetener in this recipe, coconut palm sugar, has a lower glycemic index than brown sugar, and adds a similar dark caramel flavour to the finished syrup. 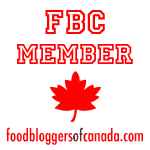 Look for it in Asian grocery stores, or in health food stores. I love lemon-lime soda – it’s definitely my favourite! 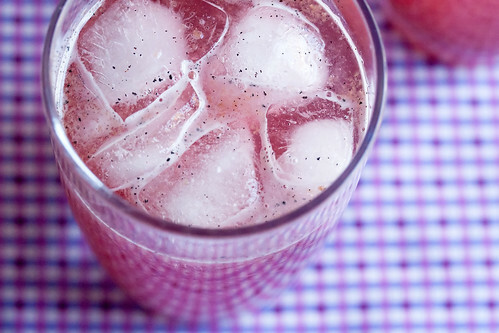 I love a homemade rhubarb soda. It’s so fresh and tangy! ooo I love italian sodas. I love all those syrups- esp their red ruby grapefruit! Happily following you on Twitter now! I love homemade ginger ale with a little lime juice. 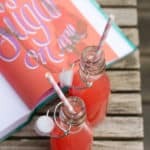 I love making homemade soda and would love to win a copy of this book. My favorite flavor of soda I make is lemon basil. I love a crisp dr pepper! My favorite is the classic cola, but I tried house-made celery soda in a deli earlier this year, and it was amazing! My favorite soda is cream soda! 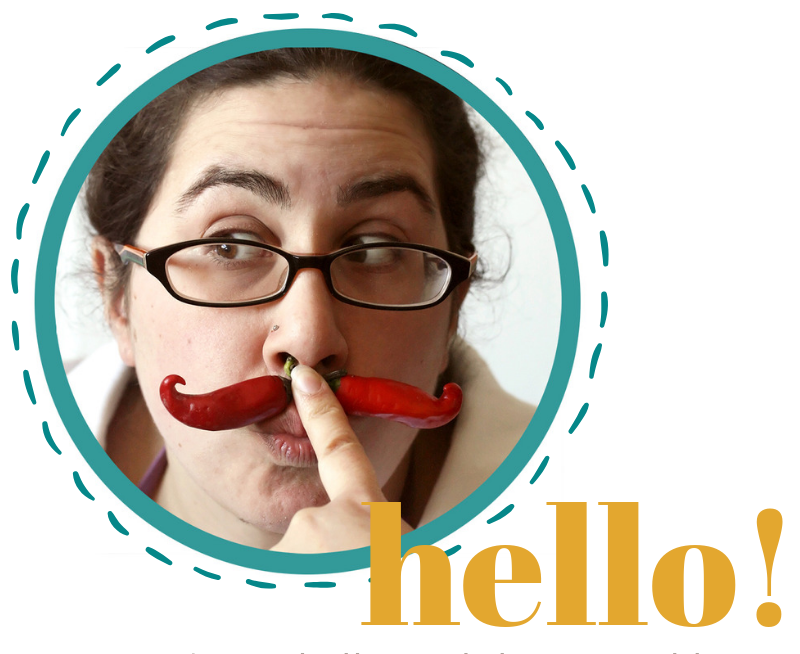 I recently tried an Italian lime soda and got hooked – definitively my fave at the moment! How could I choose just one soda flavor, and how could I choose the flavor without trying the recipes in the book? That said, I’ve been saving a recipe for homemade Coca-Cola syrup that includes culinary lavender, which I usually get in my farm box once a year. I think lemongrass and raspberry would be pretty fabulous, too, or pink grapefruit and black pepper. Fave soda combo would be raspberry lime! Yum!